Baristas at coffee shops across the country sound off on the habits of their most irritating customers. Are you guilty of these mistakes? Ever wondered if a coffee shop barista is throwing out a side of shade along with that no-whip almond milk latte? 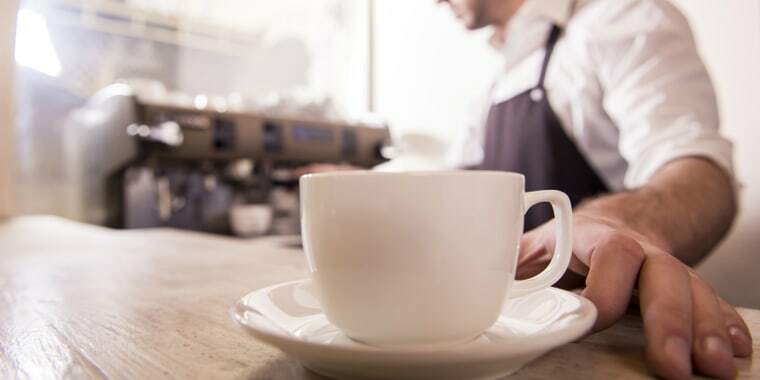 After hearing the secrets of chefs and restaurant waiters throughout the country, it was time to get the real deal from baristas about the customer habits that make them boil over. "Coffee isn't the only thing I'm brewing back here," said a barista who asked to be called JT*. "I have lots of time to brew anger." Uh oh. Here are the 12 most annoying things that customers do when ordering coffee. This is the number one offense according to every barista who was interviewed. "It makes my side of the transaction a little bit harder," said Sam Penix, owner of New York City's Everyman Coffee. "I just want to get you your drink so you have a nice rest of the day. I didn't get into this business to be a vending machine." What's even worse than blabbing on the phone? "I get the 'one-minute' finger wagged in my face," said JT. "I'm like, there's a line and I don't have a minute!" "It's amazing to me how many people will get to the front of a long line and still not have their order ready and forget about having their wallet ready," said one barista who asked to be called Java*. "This happens so often that now it's impressive to me when people who have been waiting in line for a while know what they want and have their payment accessible to make it easy," added Penix. 3. Asking "Is this any good?" "I always find this question to be very odd," said Penix. "I mean, did I get up at 6:00 in the morning to do this thing really badly? At a specialty coffee shop, everything is really heavily made with intent." If a drink is printed on the menu, there's a reason it's there. It's supposed to be good. A few of the other baristas remarked that they're baffled by the people who ask them for advice about what to get and then order something else completely. "Why even ask?" said JT. "'I'll have the mocha frappe magical unicorn latte with soy milk,'" quipped JT. "If your order takes five minutes to say, then don't order it. Everyone thinks he's a wizard who can command me to make a potion." "A lot of people come in the door and assume that you're going to mess up their order because they're used to being burned by having a bad coffee drink or service at other shops," said Penix. "Just like any other relationship, they bring their past baggage with them. The problem is trust." "Every day someone tries to grab plates, milk, even pastries with his fingers and help himself to take whatever he wants," said Java. "It's a health code violation and it's so rude." Penix once had to kick out a customer for coming behind the counter: "So, this older Italian gentleman asks me to steam milk to exactly 100 degrees for his macchiato. As soon as he hears the machine whirring, he flings his hand over side of machine and reaches for the crazy hot steam wand. I had to make him leave. You've now crossed the line into a preparation area and put yourself and me in danger." "I have lots of wonderful customers with great relationships and that's awesome, but some people will walk right past you like you're invisible," said Penix. "I just want to be treated like a human and not a machine. No need to be ultra bubbly or saccharine or weird. Please and thank you are really nice but I don't expect them. Just be you and be a nice person who comes in and has manners." "I mean, I graduated from Dartmouth College," said Java, who aspires to open a coffee shop one day. "Just because we serve coffee doesn't mean that we're doing some crappy counter work job that we hate," said Penix. "I was a barista for years before I owned Everyman Coffee. A lot of baristas take pride in being a service professional and providing to their community." "The worst is when you notice that a customer is approaching the condiment bar with a big tray of coffee and some space case is blocking it," said Joe. "This happens so often that I'm actually really impressed when someone is aware of where he's standing," said Penix. "Coffee is something that we're making on the spot and it requires skill," said Penix. "Every component of a drink has to be perfect. It's worth the dollar you throw in the jar and that $1 bill makes a huge difference to the barista." Beyond not leaving gratuity, some people will even use the tip jar as a cash register. "It's like give a penny, take a penny," said Joe. Even worse than that? "People just steal the tips," said JT. "You just ordered and there are six people in front of you — it's not yours!" said JT. "People will just pick up a random cup and disappear. On the other side, sometimes a weirdo will order, pay and then not pick up his drink." "What the heck is a trenta?" saids JT. "Is that a small? A medium? A large? I have no idea and I might have to make fun of you if you try to order that way." *Some names have been changed for fear of retaliation by hot drink-holding customers. Starbucks' Pumpkin Spice Latte returns this month! But is it too soon?